For the avoidance of doubt, this post was clearly meant to be lighthearted, we have pointed out plenty of flaws and inconsistencies in the banking union proposals both from the UK perspective and the eurozone's (see here, here and here). The idea, which we seem to have failed to express clearly, is to highlight the inconsistencies in the banking union proposals but also that a concept, weighting votes according to shares of a specific sector, which people in the UK have previously suggested and been laughed out the room for is now being suggested by Germany. Negotiations on establishing the ECB as the eurozone's single banking supervisor, the first stage of the much heralded (but yet to make much progress) proposals for banking union, made little headway at yesterday’s meeting of EU finance ministers. As we noted on our blog last month - and reported by the FT today - Germany has been insisting on altering the ECB’s one-country, one-vote governance system by matching voting weights on the ECB's proposed supervisory board to the size of countries’ financial sectors. This would radically increase its power and ensure it cannot be held hostage to member states who have much less to lose if eurozone/EU-level banking rules don’t go their way. Wait a minute. Should the UK not take up the Germans on their offer? Linking voting weight in the EU to the size of member states’ financial sectors - in the European Banking Authority or in the Council for example - would immediately eliminate fears over the eurozone writing the rules for all 27 using an inbuilt majority (a scare amongst British diplomats and officials). And in a spectacular fashion. 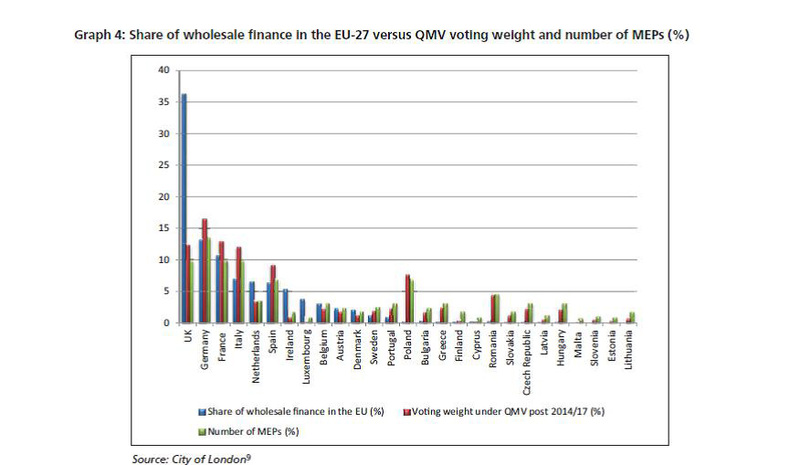 The graph below (click to enlarge), taken from our report on EU financial regulation, published in December 2011, charts member states’ share of the wholesale finance market against their voting weights under QMV. 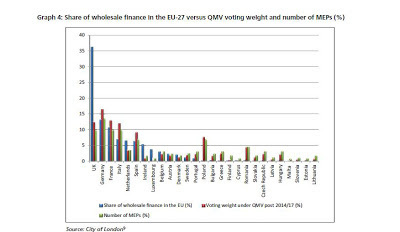 The blue column - share of wholesale finance - would represent the new voting weight under a German-style system (if it was directly proportional). Point 1: OpenEurope is a pro-EUSSR propaganda mill disguised as a Euro sceptic outfit, so its advice comes from a pro Eurofascist perspective. Point 2: The UK's banking sector is about to be gutted by the EUSSR, so any argument that suggests its size will save it in a banking union is either inane or dishonest. Would Germany want the Uk to have twice the voting power of Germany? How would France feel if the UK had more than twice their power? I see them greatly altering this proposal if the UK says yes to joining. Wielding 37% of the vote still leaves 63% to vote against the UK. You can be 100% certain that whatever the EU does, it will work against British national interests. That is why I do not understand David Cameron's support for it. Germany wants a similar sort of solution or a veto for Germany for the other banktasks. So a lot of politics going on. Anyway if you want to go for a reneg and substantially less things arranged via Brussels it is probably not the best thing to start to transfer a lot of powers to the EU especially not on a highly complicated matter. Like bankregulation is. It likley takes years to set it up again after it is gone, something the ECB/EZ is facing now or the slow learners within the EZ will realise not far from now. What about DONT join, and have rules that are in our interests! Created by US! What about Dont join and write our own rules. We are the DON in the EU Financial Sector. Open Europe: don't be so ridiculous! Euro-zone members & the UK have NO common interests at all in any matters - let alone financial ones. Therefore this suggestion is both absurd & redundant! What increasingly baffles me is how Open Europe can do so much detailed research and still come up consistently with the wrong answer. What on earth is there in the EU banking or econimic system, and their doomed plan for the euro as a steppings stone to a Single State that makes you think we should want any part of it, or that we could be in any way better off in it? Have you never heard the phrase "a triumph of hope over experience"? Have you not noticed that Greeks are wearing Nazi uniforms to declare their hatred of Germany and its policies? How much more of this totalitarian garbage do you think can be shoved down our throats before that civil unrest erupts here? And for that matter how long do you think Cameron can hold out against a referendum on leaving the asylum? I hope that Open Europe has got the message after that lot, however supposedly "light-hearted" it was supposed to be. There is absolutely no way that Britain will agree to anything resembling a cosying-up to the euro. If there;s one thing that we in Britain are totally united about it is that we have been clever and blessed to have steered clear of the euro! The project was madness born of megalomania right from the start and anything that prolongs its life in any way is a great disservice to all the people who have suffered the ills that it brings. For Open Europe even to float the matter in jest is obscene and an insult to the 50% of youth unemployed in the PIIGS countries and all those hit hard elsewhere, Have you no shame? Is Open Europe serious? I certainly hope not. Why would the UK accept ANY foreign control over its banking sector? Stay away from these traps. Open Europe you have totally lost the plot and joined the rest of the ineptocrats and banksters, and you have certainly lost my financial support as of now. As Agincourt and Anonymous so aptly stated the British contempt for an unelected Commission employing 33000 additional staff in a tier of unnecessary Government,located in one of the most expensive cities in the world; now seeking an 8% budget increase while we face another £20 billion in cuts, deserves an answer which disposes your rediculous proposals and ideas. I presume you now receive your funding from the EUSSR. Your future will as limited as the rest of the illegal empire. "For the avoidance of doubt, this post was clearly meant to be lighthearted, we have pointed out plenty of flaws and inconsistencies in the banking union proposals both from the UK perspective and the eurozone's (see here, here and here). The idea, which we seem to have failed to express clearly, is to highlight the inconsistencies in the banking union proposals but also that a concept, weighting votes according to shares of a specific sector, which people in the UK have previously suggested and been laughed out the room for is now being suggested by Germany." We shall never, ever surrender. Or at least , that is what I though. But Cameron may yet dupe us into submission. Interesting topic. In my own opinion, it is best to rule your own system and not the others' system.One-country, one-vote governance system is not a good idea.